Teeth are very sturdy and the strongest parts of the human body. So, many people expect teeth to last a lifetime. However, some issues can arise and leave teeth susceptible to extensive damage. 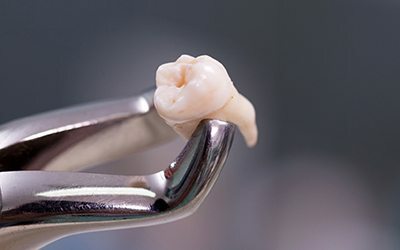 Unfortunately, teeth are unable to repair themselves, so once the damage is done, you’ll need a corrective procedure, or in extreme situations, a tooth extraction. Related Article: Tooth Extraction: Will my dentist pull my tooth? Periodontal disease, also called gum disease, is an oral ailment that affects the alveolar bone, teeth, gums, and other components of the mouth. This oral illness stems from poor oral hygiene and the inability to remove plaque, which is a sticky substance that collects on teeth. As plaque bacteria remain on the teeth and harden over time, gums pull away from teeth and form deep pockets that collect bacteria. Without proper treatment, pockets continue to expand allowing bacteria to eat away at the teeth and jawbone. After a while, this condition advances to periodontal disease, which can cause teeth to loosen. At this stage, tooth extraction is likely. The best defense against periodontal disease is adequate dental care at home and from an experienced dental professional. Dr. Skrobanek will do all that he can to minimize the effects of periodontal disease and potentially limit the need for tooth extraction. However, this is contingent on the severity of the disease. Impacted teeth are unable to break through the gums because of an obstruction. This situation generally affects wisdom teeth. Impacted teeth can be seen with an X-ray, and patients may experience persistent swelling and pain originating from the area where wisdom teeth develop. Surgical removal is often necessary to eliminate discomfort and consequences of impacted teeth. Overcrowded teeth overlap or are jammed together. These teeth limit movement or the ability for teeth to realign when orthodontic treatment is sought. Therefore, extraction is needed to provide adequate space in order to straighten teeth later. Crowded teeth can also lead to decay as they are difficult to clean sufficiently. Cracked and chipped teeth are the most susceptible to tooth decay, as bacteria can infiltrate teeth and lead to severe deterioration. For that reason, many clients are encouraged to repair teeth at the first sign of a fracture. When a tooth becomes diseased, and the pulp is infected, a tooth extraction or root canal procedure is needed to treat the infection. The type of treatment is based on the severity of the disease. At GPS Dental, we offer an array of treatments and solutions for our patients. Dr. Skrobanek is committed to helping patients maintain the health of their teeth and gums. He employs the most suitable procedure for the condition before him. A tooth extraction is only chosen when it is necessary and other treatments have proven unsuccessful. To learn more about tooth extractions and other dental procedures we have available, contact us. Related Article: What are Your Tooth Replacement Options?